Taste test: These are decent cheese puffs, with lots of cheese taste and a fluorescent orange color that could light up a room. 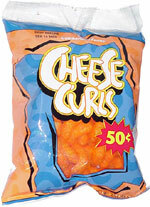 Contrary to their "curls" name, which usually applies to crunchy cheese curls, such as Crunchy Cheetos, these are actually non-crunchy puffs. They're slightly thinner than your standard Jax cheese puffs. 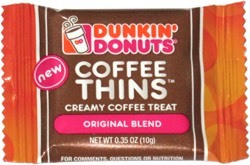 The consistency seems good at first, but when you get to the inside, some of the puffs were somemwhat stale and styrofoamy. Smell test: Good cheese puffs smell, like Jax.